by Guest Columnist, Max Larsen, Future Finances, Inc. This week we welcome Max Larsen, President of Future Finances Inc. to the blog as a guest columnist for a review of the week’s economic news. Max is a professional money manager, with $200 million under management and a long time user of Hawkeye. The past week was rife with earnings, economic data and commentary from two major central banks, but the market shrugged off the busy event calendar remaining in its range bound ways. The backdrop of a steady but unspectacular labor market is likely to keep the Fed cautious about raising interest rates and could prevent the central bank from colliding with President Donald Trump as he aims for faster economic growth. In addition to a slew of economic reports, earnings season continued to unfold. These were generally supportive of the current trend. The most significant weakness has come from large multinational companies indicating concerns about overseas activity. Despite those concerns, both earnings and sales growth are poised to expand for the quarter. Please remember that historically speaking February is one of the weakest return months of the year with the worst part coming towards the end. It may not happen this year. There is a lot of money flowing into stocks right now. 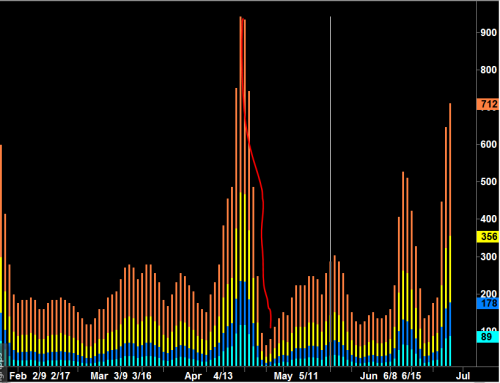 Just look at the bottom indicator called the ROC or rate-of-change. This is nothing more than how much the S&P 500 changed on a percentage basis on a daily basis. I high-lited the 79 days in blue. It denotes a strong market to me. The second chart is one you’re very familiar with. This is the 8-months chart of the S&P 500 (daily prices). Notice how we came into the “Support” zone last week and bounced out on Friday. Thanks for the note. The market is responding to views that tax and regulatory changes from the new administration will help improve economic conditions. We do believe in the short term we will see a slight pullback (maybe 5%), but that would be normal and draw in new investors. The technical and fundamental pictures are pretty healthy right now, but volatility will remain present as it did last year. We have several positions in the portfolio that help us hedge any market swings so unless we see significant deterioration in the charts, we are comfortable with the moderate risk exposure we have in the portfolio. Brad is correct. 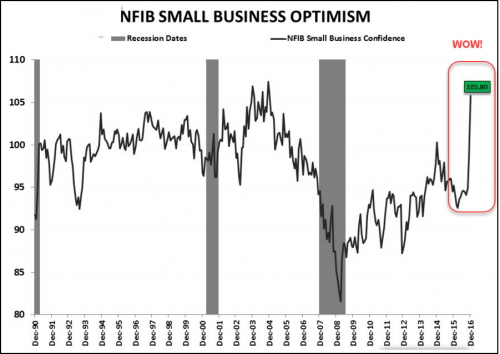 Just take a look at the most recent NFIB Small Business Index. Like its title says – it measures the business optimism on a quarterly basis. This stratospheric 38-point jump in the number of business owners who expect better business conditions is staggering. Whether you like the President or not – and I know there are many who don’t – it is what it is and we have to live with it. That said, there is little doubt the WSJ’s headline hits it on the head: “Trump Pace Has Heads Spinning.” Many businesses are very encouraged that someone is finally attacking the mind-numbing regulations and restrictions. 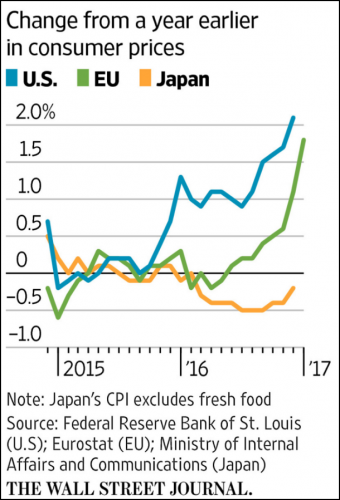 After years of fighting against deflation, the U.S., the eurozone and Japan show glimmerings of life in consumer prices and wages, evidence that an era of exceptionally low inflation is receding from the global economic landscape. Several factors are behind the move, including a rebound in energy prices, falling unemployment which is reducing slack in some labor markets, and central banks’ low-interest-rate policies that spur lending and economic growth. 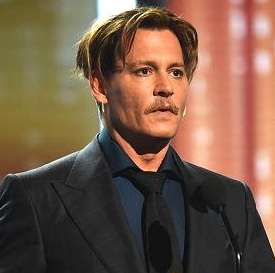 The lawsuit said Depp paid more than $75 million to buy and maintain 14 homes, including a French chateau and a chain of islands in the Bahamas. Depp also spent heavily to buy a 150-foot yacht, fly on private jets and cultivate collections of fine art and Hollywood memorabilia requiring 12 storage facilities to maintain, the lawsuit said. $2 million per month and $75 million in non-income producing assets? What could possibly go wrong? He’s obviously a very talented actor yet it boggles the mind that he could be so inept with his finances – whether he had an advisor or not… You can read the entire article HERE. That’s more than enough for this week my friends. Congratulations to the New England Patriots. Wow, what a game. Multiple records broken – including the biggest comeback in Super Bowl history. It just goes to show you – never give up. Have a fantastic week! 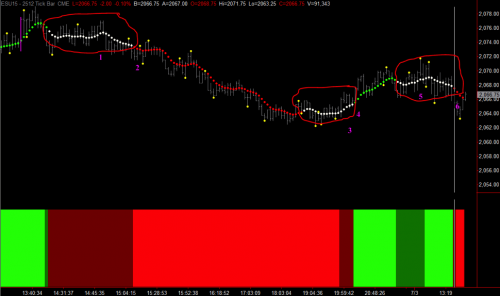 With so much in the news regarding financial meltdown, let’s take a good Hawkeye look at the eMini. Firstly look at the Hawkeye Volume – three months of no demand and one month of selling volume, giving you the heads up that the dominant uptrend was going to retrace. Now, look where I have placed the dotted lines on the price. The higher one shows a double top with the two Hawkeye Pivot dots in yellow, the lower dotted line shows where price came to and found support right at the Hawkeye stops (indicated by the green crosses). 6 Ways a Market Moves shows congestion, and if prices rise next month a Hawkeye Pivot low will be printed. However, if the low of this monthly bar closes under the Hawkeye stops, a down trend will be established. Now it gets interesting. Remember what I teach at Hawkeye seminars – “The Tanker Effect”; when the markets are fast and volatile price shoots through the previous support. Look at the lowest price bar. Three days back it straddled both previous lows (shown by the blue lines on the chart), and rallied on buying volume, followed by two days of neutral volume indicating support as shown by the price action. And now the final piece. 6 Ways a Market Moves. Look at the Trend dot crunching right up, still down so still a trend run. But if Monday is up the dot will go flat indicating congestion entrance. Firstly I do hope you opened the email announcing the International Trading Profits Summit in beautiful, warm Palm Beach, USA in March. I really have assembled a wonderful team of traders to give you the tools and knowledge to make 2016 a fabulous year. Extended to three full days and kept at the same price of $750. So please come along. Secondly, I wish you a very Happy and Prosperous New Year! So, lets jump right in and take a look at what the new year is bringing in. All financial letter writers will be talking about the first week of trading, and in particular the stock markets, which have all had nearly a 10% down move from the 2015 highs. With the markets rallying in the morning session only to be sold off in the afternoon, this the typical thumbprint of a market in crisis, with the bias to the downside. But let’s look at Hawkeye and the charts. You can see where I have placed the yellow dotted line there had been four attempts to break that price, but now we are in congestion. With the Trend dots flat and white, and support off the Hawkeye Zones at 1785, and volume showing no demand and bias to the downside. This makes it all far more visible. Price rejected off the Hawkeye Zones and testing the Hawkeye Zone at 1887. 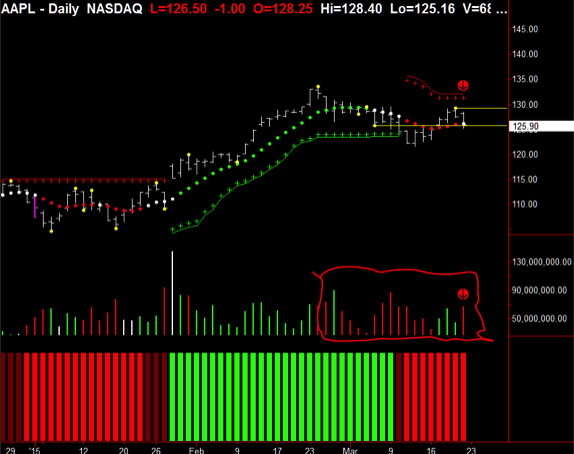 Interestingly, Friday’s volume was normal and close to the bottom of the range which leads me to think that it was an amateur down bar. If the professionals were selling there would have been far more volume. This really does tell the story – the downtrend on Thursday gave high volume followed by average volume on Friday. Again suggesting amateur selling not professional. This week will tell all. There was good jobs news last week in the USA and the market should have rallied. So let’s see if it finds support off the daily and weekly Zones and rallies. Three charts to look at this week. Let’s start with America’s most widely held stock, Apple. 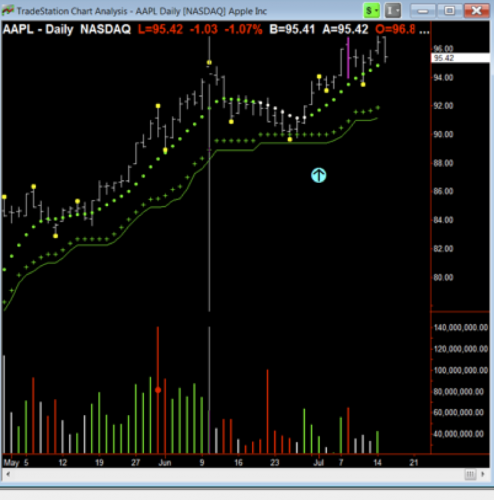 Looking at the daily chart, I have placed a blue line after Apple had a Wide Bar down (first blue arrow) then rallied back up. There are now six Hawkeye Pivot lows, and the Trend is neutral, indicating congestion. 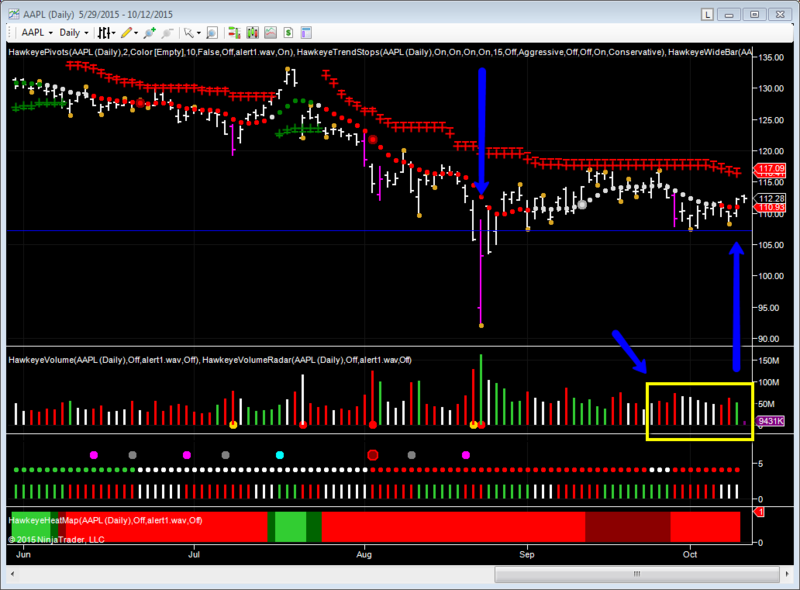 But look at the Hawkeye Volume (last two blue arrows) – classic accumulation volume. So expect a test to 116 area, and if taken out, the commencement of an uptrend. Now let’s take a look at Coffee. The Wall St Journal said this week that food prices have increased for the first time in 18 months, and the Brazilian Real is showing strength, which is good news for coffee and the charts are starting to support this. 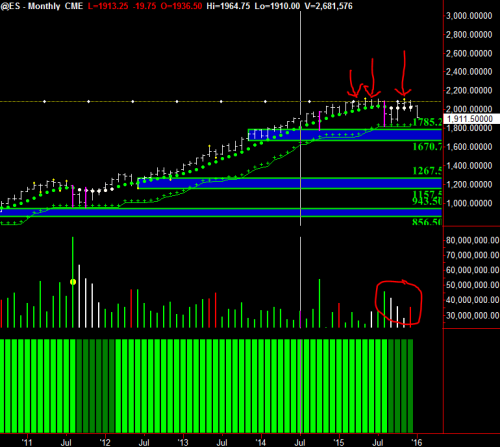 The monthly chart shows the price right down and found support at the Hawkeye stops (indicated by the cyan arrow). 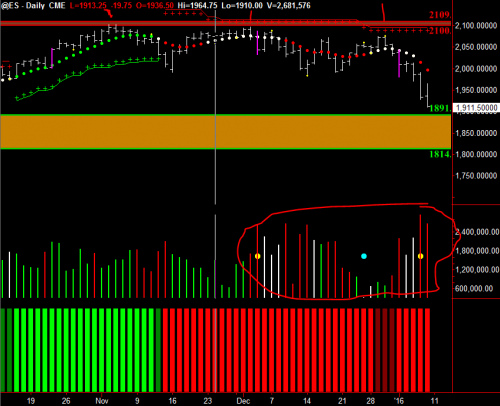 The weekly has a Hawkeye Pivot low and green buying Volume (indicated by the cyan arrow). 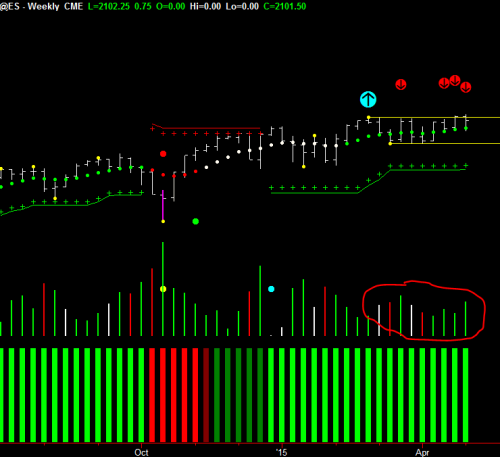 The daily shows a great example of accumulation volume taking place after a considerable down trend (indicated by the cyan arrow). Be patient, a set up is imminent in all three markets. Now, all of this (and much more) is demonstrated in our FREE training room every Wednesday at 9am Eastern, by my colleague Randy Lindsey. So, I cannot encourage you enough to come along to the Wednesday room. Please contact us at [email protected] for any questions you might have about using Hawkeye Indicators in your trading! 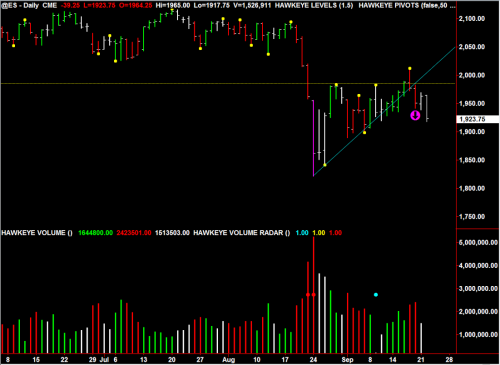 A few weeks ago I did some analysis in the Emini, saying last week would be critical and it was. So lets take a look at the chart. Where I have drawn the yellow dotted line showed a double top, the bar prior to the magenta arrow broke though but straddled the price. So, if you were a rookie trader you could be forgiven for thinking it was a breakout to the upside. WRONG! Resistance areas are not rods of steel but rubber bands, so that bar in fact just stretched the resistance area and then came back. Look at the bar where the magenta arrow is; no part of the bar is touching the blue support up line, hence that is a break of support/resistance. So, you can see the importance of the Hawkeye rule to wait until no part of the bar is touching support or resistance and the Hawkeye Volume is colored in the direction of the breakout. I have had a few emails over the last two weeks requesting I give you a Hawkeye analysis of the S&P – so here it is. 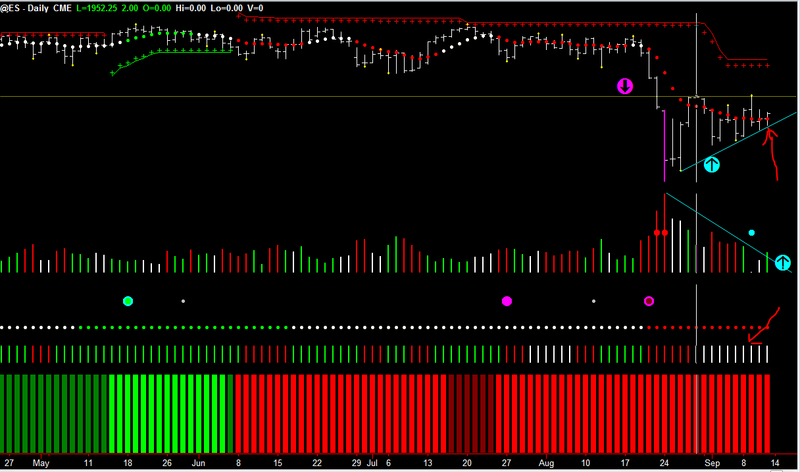 To set the stage for the Daily chart, let’s look at the monthly and weekly charts and see what they are telling us. The monthly chart has entered into congestion, based on a Pivot high from three months ago. 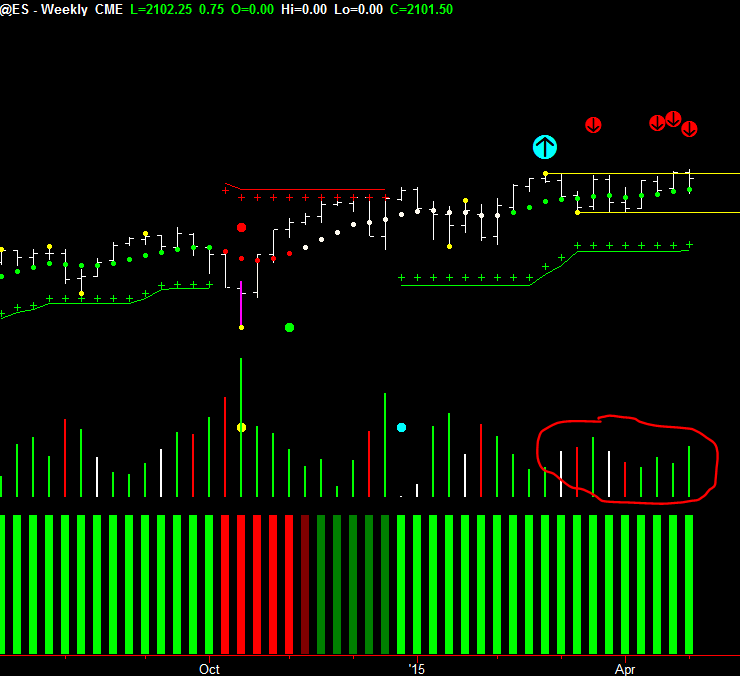 The weekly chart is also in a wide congestion zone, with the high at 2117, and the low at 1821.75. Current price is closing within the previous wide-range bars, which is what we expect to see. Now to the interesting part. This week is a big week. Wednesday begins a two-day FOMC meeting, and the markets will be waiting and choppy till the announcement. So lets look at the chart. The magenta down arrow shows overhead resistance. 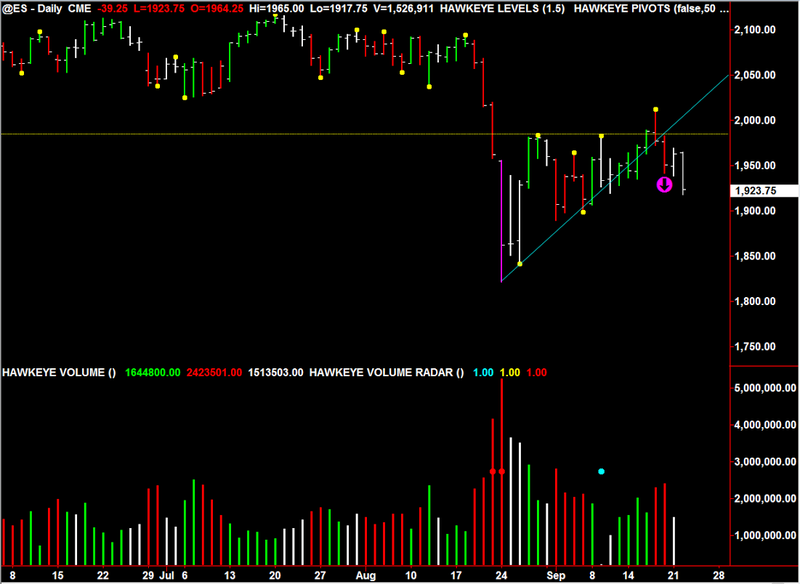 The first cyan up arrow shows the Trend line supporting the market. The second cyan up arrow shows the Trend line on the volume, showing a buying volume profile has started over the last three days. 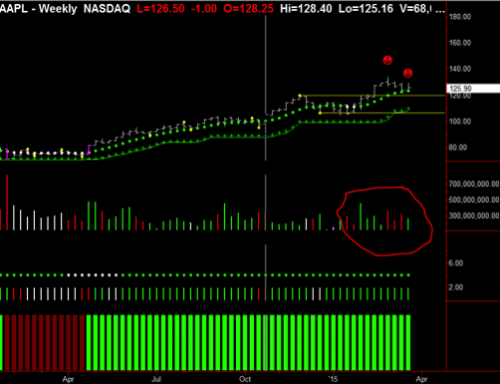 The red arrow pointing to the Roadkill indicator, set to three days, shows no demand volume either up or down. The red arrow on price shows the Trend dot is flattish, showing congestion parameters, Wednesday’s pivot high and Thursday’s phantom pivot low. With news later this week, no swing or position trading till that is announced. Remember you are trading risk. However, all will be revealed when the magenta arrow line is broken or when the cyan up arrow line on price is taken out. Volume is showing an upside bias at the moment. They fail to hold their trades for the maximum profits. So, in this week’s article, I will highlight how to resolve these two problems by swing trading with Hawkeye indicators. Below, I’ve included six charts in different time frames and markets. They span everything from stocks to bonds and commodities to Forex. Frankly, I could have included dozens of charts, because these principles of swing trading apply in any market. And by using Hawkeye indicators, finding extremely profitable entries and exits is easy. The key thing to remember is to wait for the best entries, when all three time frames are in agreement. To illustrate, on each chart, I’ve marked the point where all time frames are in agreement and we are presented with a safe and easy entry as marked by the red and cyan arrows. In every case, you can see that by waiting until all three timeframes are in agreement, you can enter a long and profitable trend. Then, by holding the trade until your profit target is hit, or you are stopped out, you can make significant profits without all the flurry of trying to get in and out with scalp trading. Please take a few minutes to carefully study the charts below. Now, all of this (and much more) is demonstrated in our Wednesday room by my colleague Randy Lindsey. One of the biggest frustrations for traders is entering a trade, only to see it immediately reverse against them. That’s why I developed the Hawkeye Heatmap indicator. 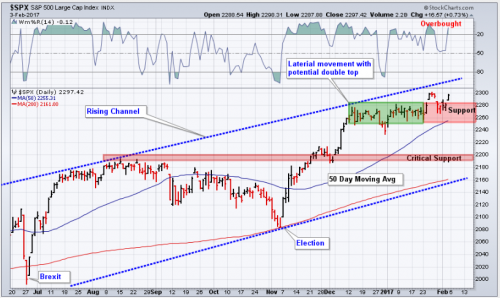 Its purpose is to give an objective indication of the strength of a trend. By entering trades in the direction of a strong trend, Hawkeye traders can significantly boost their profits and reduce their losses. In this week’s article, I’ll show several examples of how the Heatmap works and how easily it reveals the strength of the underlying trend. Let’s begin our discussion with this first chart of the E-mini (from July 3, 2015). The Heatmap (on the bottom) takes the three variable inputs from the Hawkeye Trend — conservative, normal and aggressive, and shows you visually when all three trends have locked into place. 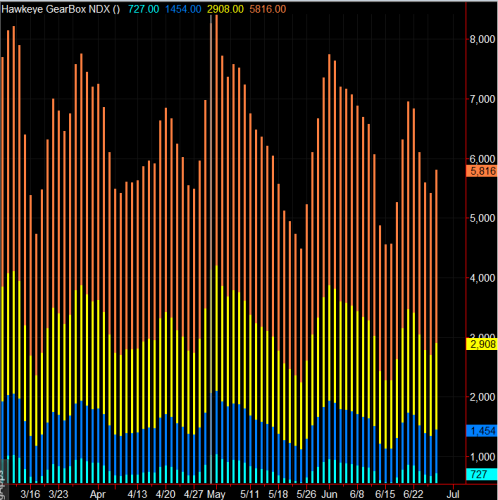 This gives you a clear view of the overall market sentiment and quantifies risk. 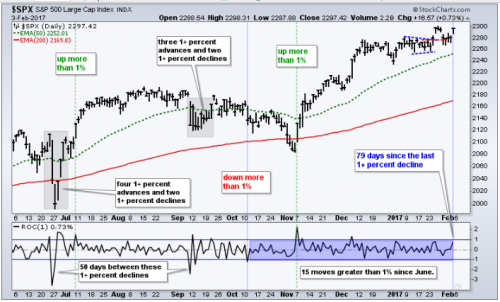 DARK RED OR DARK GREEN – one or two of the trend speeds have locked out of the trend, and the market may be pausing into a congestion area or reversing. In the example above (where I have the number 1), it shows that the trend is in congestion, as you can see by the white dots. But, if you look at the Heatmap underneath, it’s in dark red, which is telling us that the bias is to the downside, however, all three trends are not in sync. So, if you want a safer entry, you would wait until point number 2, where the Heatmap goes bright red, and then down it goes. Similarly, let’s consider the long entry as marked by numbers 3 and 4. You can see that the trend has gone from bright red to dark red, showing us that the trend is weakening. One or two of the trends have clicked out (hence that’s why it goes to the darker red at point three). And then, at point 4, the Heatmap goes bright green, and up it goes. At the number 5, you can see the trend goes flat, the Heatmap goes dark color (telling us that the trend momentum is stalled), and the bias is still to the long side. Then, at number 6, Heatmap goes bright read and prices immediately drop. 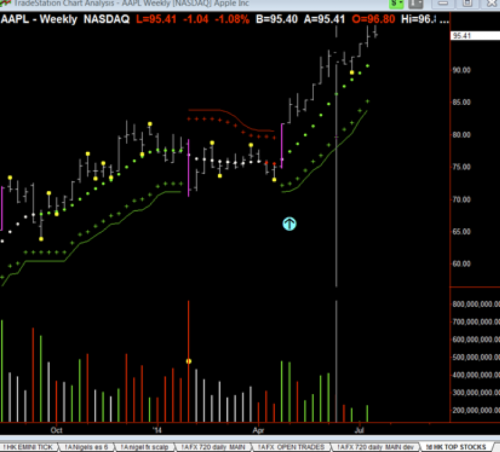 Now, the next example is the weekly chart of Apple, the most widely held stock in America. And again, you can see at point 1, we have two dots of white, and then, the Heatmap goes dark red, followed by bright red. And bang! Down it goes. At the number 2, the Heatmap goes from bright red to dark red, showing that the trend strength is dissipating. And then, it goes bright green and bang! Up it goes. The same for point 3, where you see the Heatmap goes dark red, showing us that we are in a trend pause. We have entered congestion, and at point 3, Bang! The Heatmap goes green, and up it goes. At point 4, although white dots come in (showing us that the trend is going flat), the Heatmap gives you the confidence to stay in this trend and continue on up, because it is just saying everything is in place. 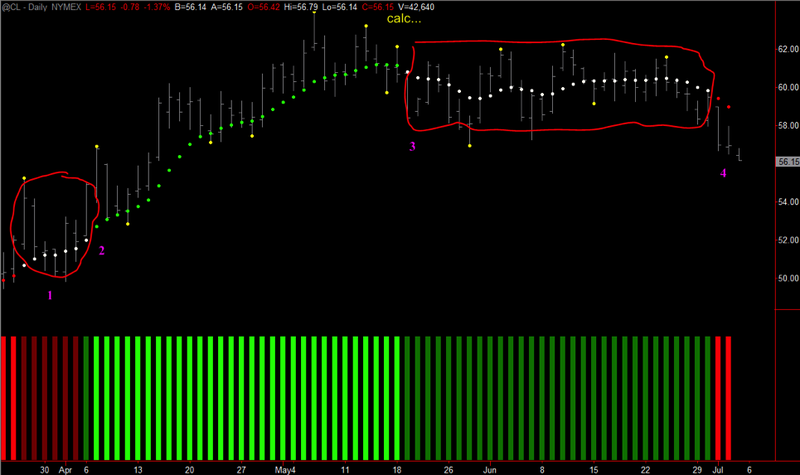 Lastly, let’s consider the daily chart of Crude. You can see that at point 1, we have gone into a trend congestion, and our Heatmap has gone dark red. Then, at point 2, the Heatmap goes bright green, and off we go up to point 3. At point 3, you can see that the Heatmap has gone dark green, showing us that the strength has gone out of this up move. Although the bias is still to the upside, there is no momentum in this. And the circle that I have drawn around three all the way across to four is something that took me many hours to perfect and find out the answer. And, I haven’t seen any other software out there that would run for that length of time just showing congestion. Then, at point 4, the Heatmap goes bright red and Bang! In it comes, and the market starts selling off. So in summary, the Hawkeye Heatmap solves one of the biggest frustrations for traders. That of entering a trade, only to see it immediately reverse against them. By simply entering trades in the direction of a strong trend, Hawkeye traders can significantly boost their profits and reduce their losses. One of the biggest challenges intraday traders face each day is determining what time frame to trade. That’s why I developed Hawkeye’s Gearbox and Gearchanger. These world-class innovative tools show you, day-in and day-out, the absolute best way to trade the markets using tick charts. So in this article, I will walk you through how these tools work to give you much greater insight into what’s really going on in the markets and how to trade them more profitably. On the right hand side of the chart below, notice that there are four labels. First, there’s 5816 which represents the slowest tick speed trade you should currently consider using. 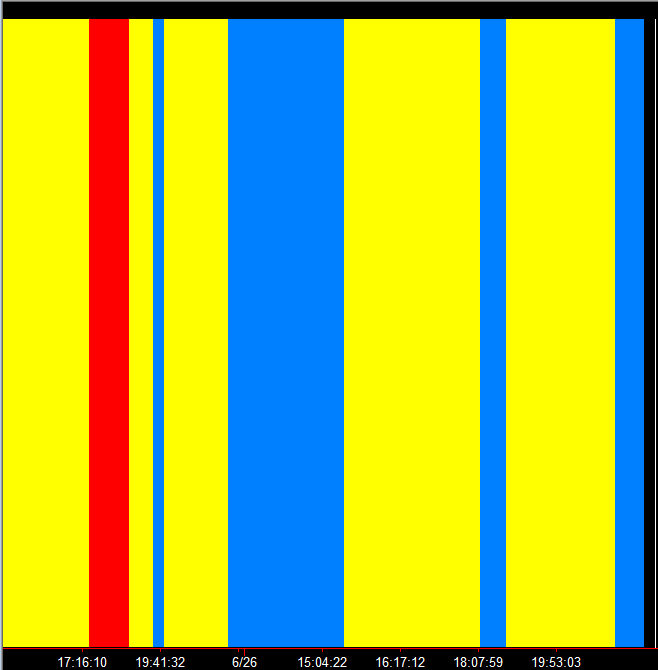 Next, there’s 2908 (marked in yellow), which is the medium time, followed by the blue, which is the fast time. 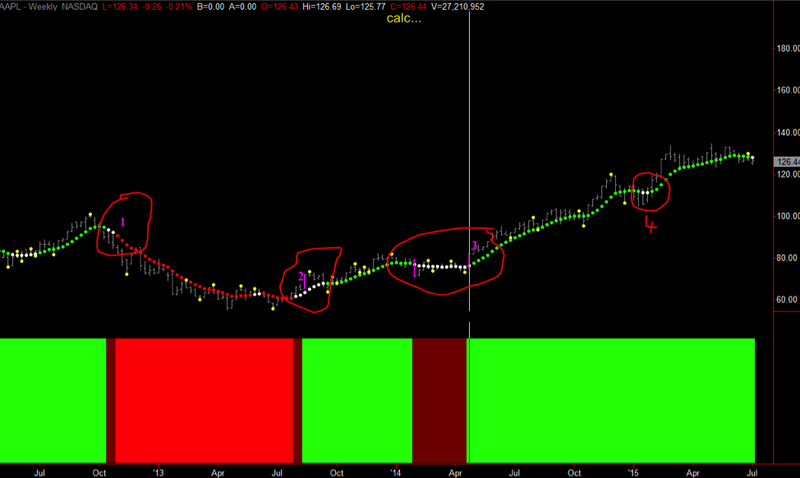 And finally, the cyan is the ultra-fast time frame you should use for scalping. As an illustration, just as a cyclist has to change gears when they approach a hill, we as traders need to change gears as market conditions change. 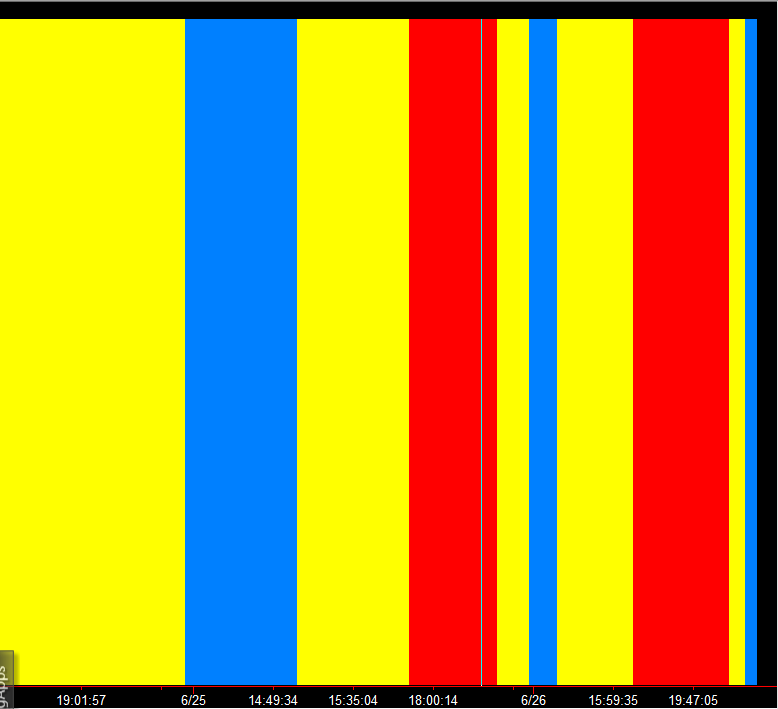 For example, look at the spikes on the above Gearbox chart. Notice how at one point, it goes up to over eight thousand ticks and then, drops right down to under 5000 ticks. Obviously, as market conditions change like this, our approach needs to change, because we must trade in harmony with the speed of the market. And that’s what the Gearbox does. It shows us what tick speed to use. And the best part is that this works on all trading instruments including forex, stocks, and commodities. 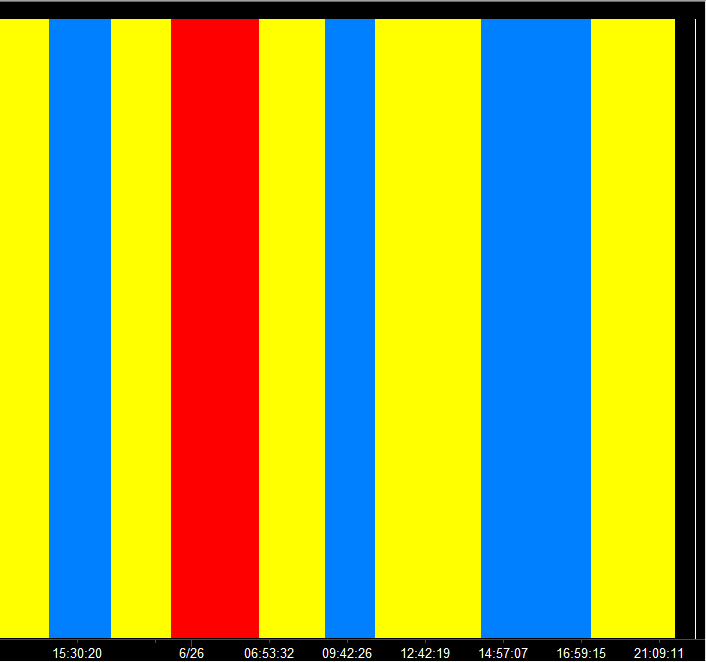 Now, Gearbox is coupled with a second tool that I call the Gearchanger, which is displayed in the multi-color chart below. When the GearChanger is blue, you should be trading in the fast tick speed. When it’s yellow, it tells you to trade the normal speed. And when it’s red, it’s telling you the market has slowed down, so you should trade at a slower speed. Let’s continue with an example of using Gearbox on the EURUSD currency pair. See how the tick speed fluctuates a lot each day? And when we couple this with our EURUSD Gearchanger chart below, you can see how it tells you exactly what tick chart to trade in harmony with the market as it speeds up and slows down. As you learn more about these tools, you’ll come to realize how powerful these two tools can be in your trading. Also, if you are a stock trader, these two tools can also help your trading. Here’s an example using them on Netflix (NFLX). Notice the amazing amount of volatility on the chart! If you were just trading a time chart, you would have no visibility into what was going on with all this time volatility. Using a 5 minute chart would be far too fast when this is at the top around 900 ticks. And, it would be far too slow when you are at the bottom about 89 ticks. So, in conclusion you can see how powerful these two tools are. Every day and throughout each day, they reveal what is the best tick speed to trade with. If you haven’t been successful in intraday trading yet, this is the key that you have been looking for, especially when coupled with Hawkeye Volume. What Do Apple And The ES Have In Common? 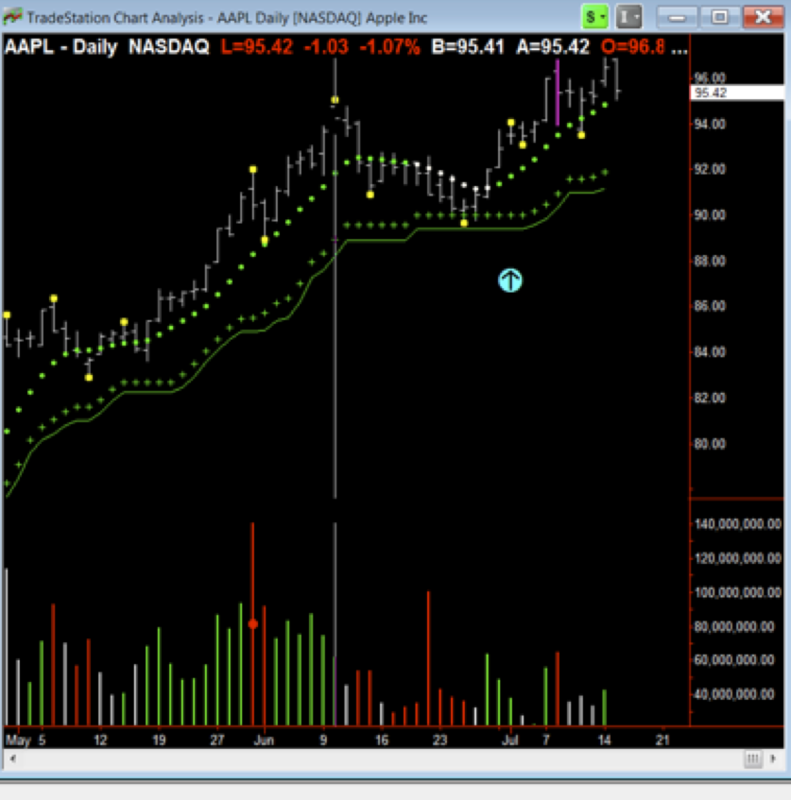 In today’s article, I’ll start with the chart of Apple, because it is so similar to what is happening on the E-mini chart. So first up, notice where I have put the yellow dotted line, where the first red down-arrow is, and how Hawkeye had a phantom isolated high at that point on the 27th of February at a price of 133.60. As you can see from that point, the market has just gone sideways, although the trend dot is slightly rising. Now, the volume that is displayed on the chart doesn’t show a Hawkeye Volume Radar dot on it, because one wasn’t generated. 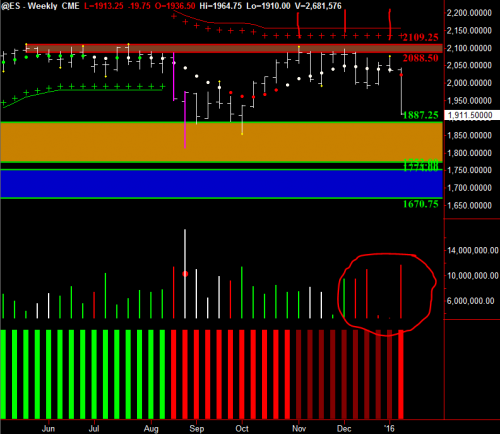 Which means that although this appears to look like high volume, the fact is that it was just average volume. And if we look at the range of the bar, it was an average price range bar, which means there was no selling coming into this at that time. It is just in its distribution mode. And if you look at the volume at the bottom, which I have circled, you can see that it is classic cyclical change of trend volume, where you would go red, green, no demand with the whites, etc. You can see that it’s trying to make up its mind in a distribution phase. And unless it breaks out of the 133.60 range and closes at the end of the week right up above that mark with the rising trend dot, we’re still going to be in our weekly cyclical change of direction. We will still be in our trend pause mode and distribution. 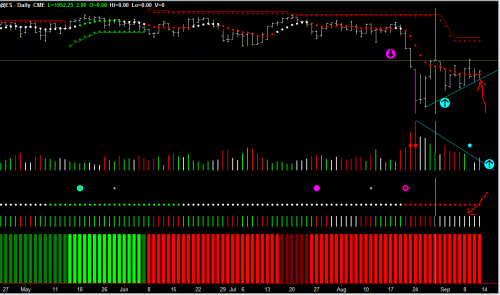 We will be in our congestion zone at the top of the market waiting for enough volume to come in to push the market up. But when I show you the ES, you’ll see that it is totally dependent on that chart. Now, let’s move on to the ES chart. As you can see, I have placed a cyan arrow pointing up. That occurred on February 27, and that isolated high, which is been indicated by the yellow dot on the Hawkeye has held all the way since 27 February. And this week we visited that price, and it hit it and backed off again. As you can see, there are four red arrows, showing you that there have been four attempts to get through there, and all have failed. If you look at the volume, again you can see that is total topping volume going on. 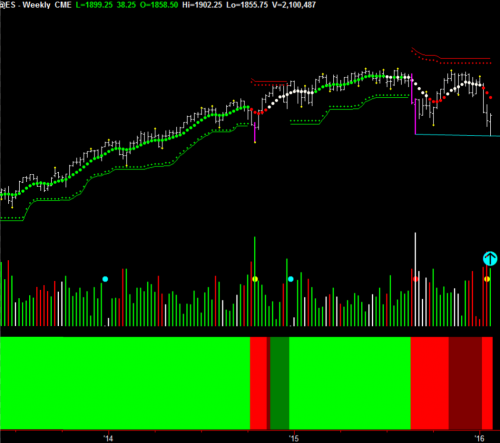 It’s not a trend volume, because trend volume would all be green. But you can see that there’s red, green, white no demand, red, green, green, green. 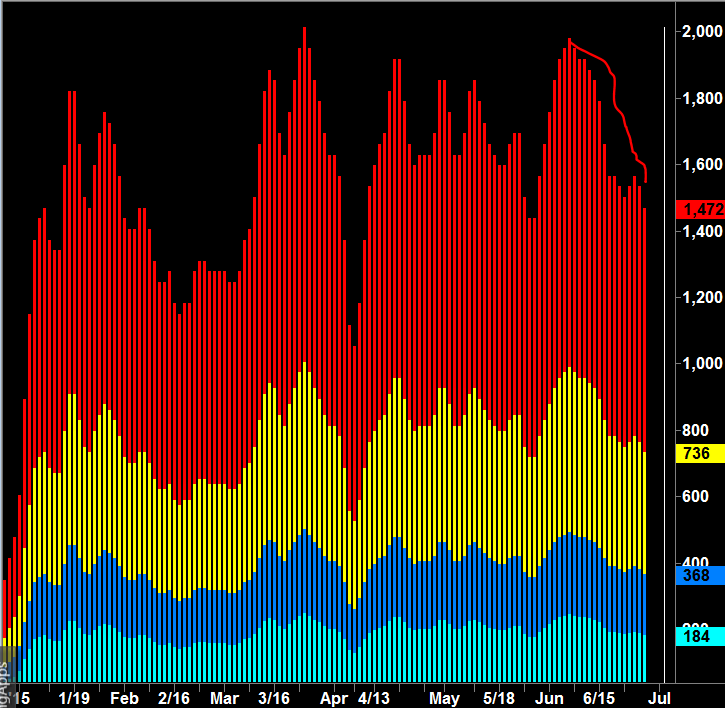 So in the last four weeks, you’ve had green buying volume coming into the ES, but the price hasn’t moved. It really hasn’t gone up, and it achieved a breakout of that high on February 27, and continued a trend run. So this week is a very important week, because it really has to do something. So, any of the Gann traders who read this, you know that WD Gann said; on the fourth or fifth attempt prices normally go through support and resistance. Well, it backed off on this fourth attempt to get through this resistance. And this coming week, we’re going to see whether that was a back off, or whether it is going to go back up through the isolated high yellow line that I’ve drawn off the pivot high that occurred on February 27th. So, in fact, if you look at the two charts also, between the ES and the Apple, you can see that time-wise they are both struggling around those price areas, and that were achieved on February 27th. So, it’s going to be an interesting week coming up, and let’s watch it carefully. It’s going to be absolutely fascinating to see how this plays itself out. At the moment, the market is in total congestion on both markets, and we are waiting to see breakouts occur to the upside this coming week. Let us begin by doing a review of the dollar, because it is in an amazing uptrend. There are a variety of fundamental reasons for this. One is that the Fed is expected to tinker with interest rates soon, and many are predicting that it will be in June. Another, because of the conflicts around the world, particularly because of ISIS, money is flowing into safe havens. This is all having a huge effect on the stock market. A lot of exporters are being hit and are losing some of their bottom line because of this high dollar. So, the exporters are feeling the pinch. 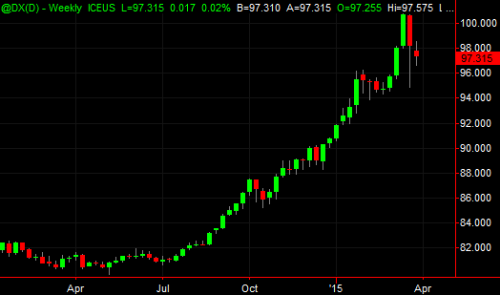 And, as the dollar continues on this huge trend, expect more. And now, if we have a look at the ES, there is a critical point, and that is 2110.25. This area has a Hawkeye High Pivot. And the weekly has to close above 2110.25 on this Friday to show that is in an uptrend. 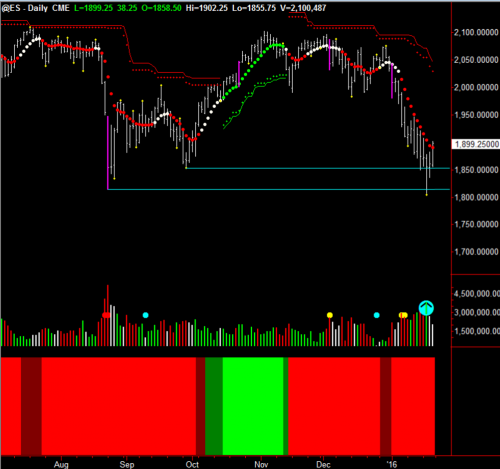 Otherwise, we are entering congestion on the ES, and we are also in congestion on the daily. 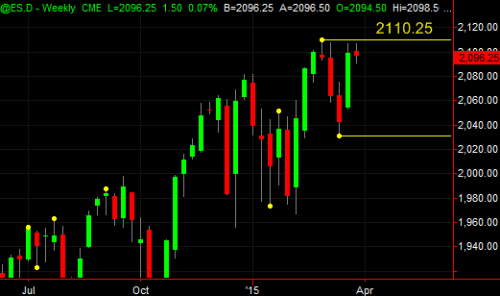 We have to take out this area – 2110.25 – with no part of the weekly bar straddling it this coming Friday. And that will indicate that an uptrend is on its way. Now, let’s look at Apple. I’ve given you two charts on Apple, both the daily and weekly. 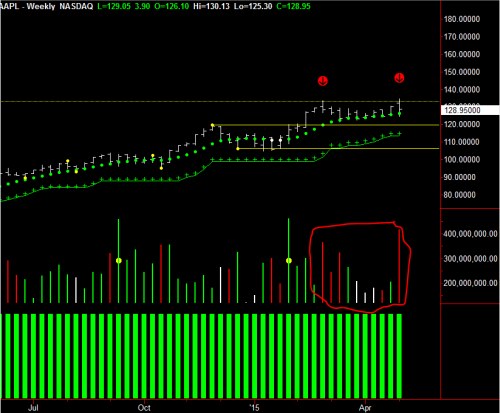 And, you can see that where I have circled the Hawkeye volume, we have a typical congestion entrance set up. That is because the volume is not showing continuously green volume. It is showing buying, selling, buying, selling, showing chop. And, where my first red arrow on the weekly is, you can see that I have a phantom high there. 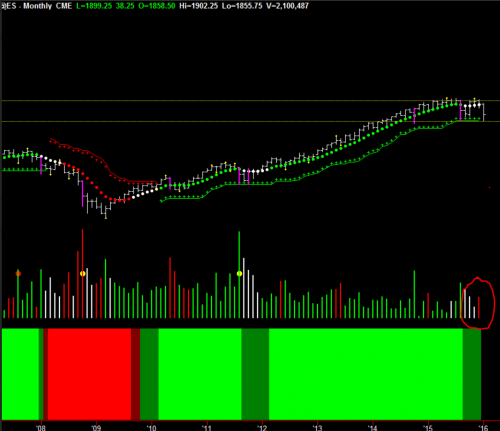 And on my second arrow, although I have green volume, the close is in the mid part of the bar. But look at my trend dot, because it is starting to flatten out, showing that the momentum to the upside is stalling, and distribution could be taking place. Don’t forget, if you haven’t picked up a copy of the Hawkeye Volume Starter Package yet, please CLICK HERE, and get started using Volume to start increasing your profits today! We teach this and many other methods in our live training room held every Wednesday. Click this link for more information or to join us in class. Want to profit from Volume? Here’s how. Apple is the most widely held stock in America. If you look at the daily chart, you can see it has been in an uptrend for quite some time. 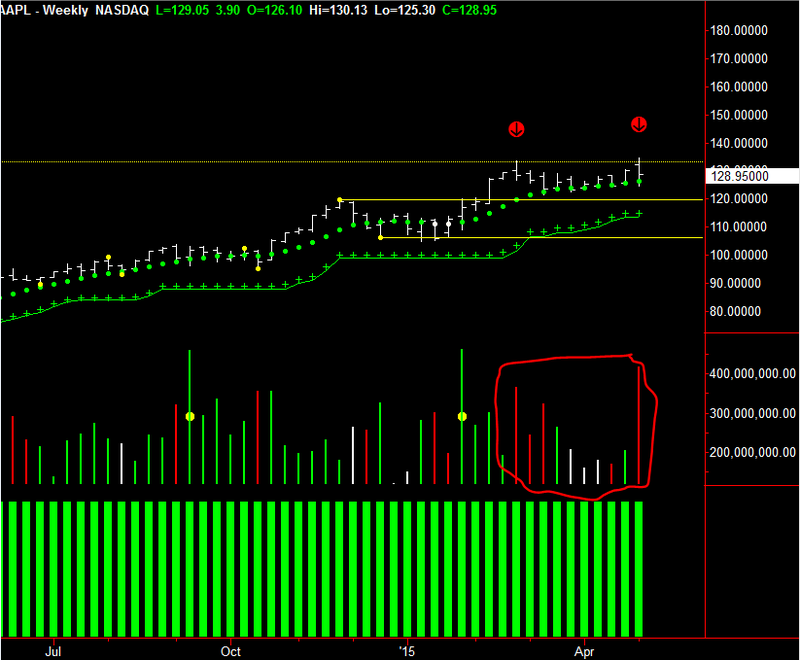 There was a brief pull-back in late June, and then, it continued upwards on declining volume. However, notice throughout the pullback, it didn’t break the Stop or Crash Barrier indicators (indicated by the green crosses and the solid green line). Now, notice the point where I’ve marked the chart with a cyan-colored arrow. 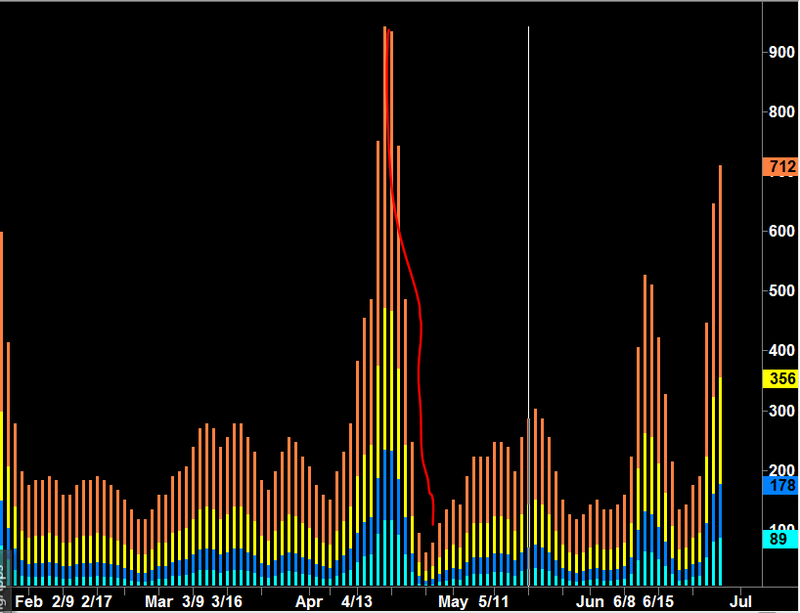 You can see that when prices began to rise, volume was increasing and how it pushed the market up. Next, see the large magenta-colored bar on July 8th? That tells us the market will most likely go into a pause (in fact, this Widebar indicator is accurate about 80% of the time). As I write this weekly newsletter (on Monday, July 14th), you can see that the current bar is pushing out above the magenta bar. But please remember, if you’re trading is based on daily and weekly charts, I don’t consider there to be a breakout until ALL of the current bar is above the support or resistance. At the moment, the current bar is straddling the resistance, and you can see this if you draw a line off the top of the magenta bar. So, I would still say that this market is currently in congestion on neutral volume. 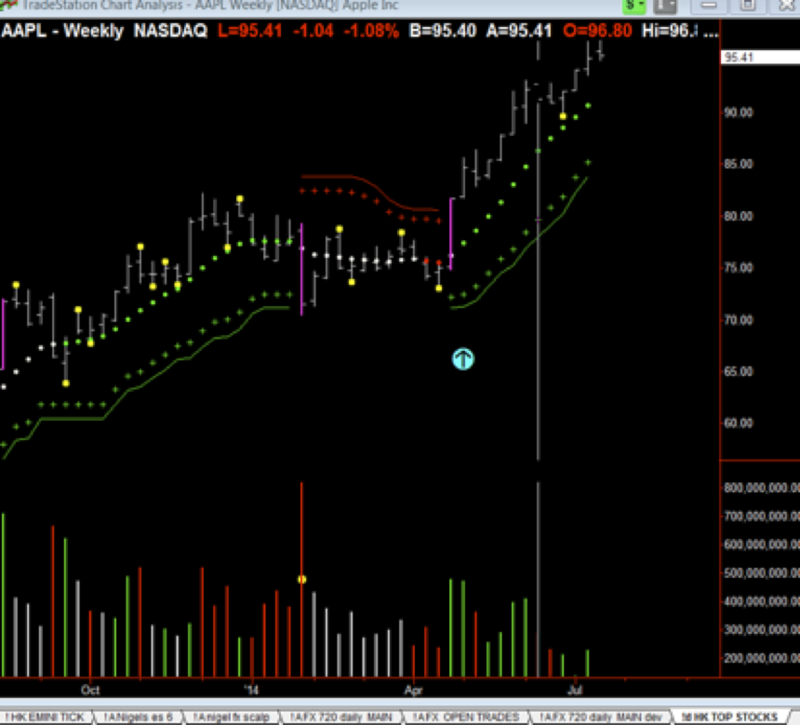 Now, if we look at the weekly chart, you can see that Apple is in a power trend up. And, you’ll also notice, this is happening on green buying volume, with the Hawkeye trend dots moving up in a very orderly manner. So, all of this points to a market that is being accumulated. But of course, if you look at lower time-frames (like the daily), you’ll see the whip-lash of the vibration, but it holds firm in this trend. It appears that this trend will continue its way up, providing the overall index goes up. So, what is the Hawkeye perspective on Apple? Apple is in an uptrend, it’s in congestion on the daily, working its way out of the wide bar range, which occurred on the 8th of July, but is in total harmony with the weekly chart. This week Mike Smith reports direct from the Hawkeye Options desk. Its earnings season and so out pop the latest plethora of NEW; INNOVATIVE; EASY; PROVEN etc. etc. headlines about a strategy that has been around as long as options have been in existence. They say straddles and strangles are the way to trade a high volatility market (by definition it isn’t a volatile market by the way – just look at where the VIX is – there is a difference between choppy and volatile – a later discussion perhaps). (AND of course Barracuda at 191% end of day last session in less than 7 months is evidence that this is nonsense). They will fail to mention that options prices go up pre-earnings – a little thing called implied volatility – (which is in simple terms, a forward looking measure based on how likely something could move from its current position – in an individual option position there is NO time when this is at a temporary high just before an earnings report). So you can pay over the odds for a call and pay over the odds for a put, and the underlying has got to make a massive movement for you just to break even. Perhaps we will run a session on this, as there are ways to overcome such issues, but we have other fish to fry right now…just be aware. Onto the happy stuff. As we are in week 1 of earnings season, I have put a blog post up at HawkeyeOptions.com that may be interesting. This explores the reasons why the pessimism pre-earnings (as seen in the recent market pullback) may lead to a continuation of the bull market we are still in (see the weekly trend in the SPY). You can read more here. So, we are in a new quarter and as usual I am going to run a FREE open session, which looks into the crystal ball (which has been on the button the last 6 quarters these have been running). Our predictions for US and global equity markets this quarter. Which strategies may work and which to avoid (as they are likely to rip away huge chunks of your capital). The 5 things you MUST monitor this quarter to ensure you are at the front of the pack when things are likely to change. Our predicted date for the next market correction and the catalyst that may drive it. Where next for precious metals (and this may surprise you)? And we will be revealing 4 stocks that are most likely to outperform the market between now and the end of June. Although with an equities/options/ETF bias, whatever you trade this is ESSENTIAL information. You can register here. This is simply a service we offer to all those who have expressed an interest in what we do and is a NO SELL zone session. Feel free to share this link with others as it IS an open session. 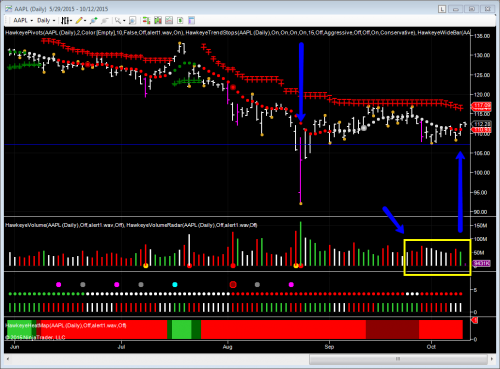 Watch YAHOO…yesterday’s earnings attracted some massive buying interest in after hours trading. As always…trade safe and learn with passion. Hawkeye teaches you to Swing!